Here, you will find out what went on behind-the-scenes. Can you imagine the number of people with scars from getting a little too close to a hot pot belly stove? Most importantly, nobody complain about the smoke in those days. Now we have electric or gas heat we can hardly afford to use and everybody complains about smoke. 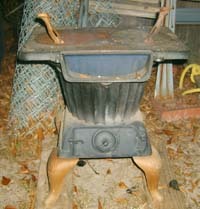 Constructed of all cast iron, this stove burned both coal and wood. Its generous firepot capacity with shaker grate made for a nice and cozy room. 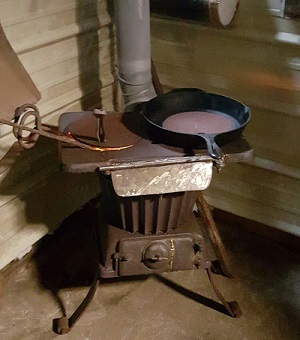 Dating back prior to 1950, it was used for heating, cooking and bathing. The "Pressing Iron" demanded respect.